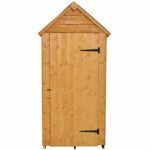 The Hartwood 3′ x 5′ FSC Starter Overlap Apex Shed would be a fantastic shed for a person looking for their very first shed to keep a few items safe and out of the rain. 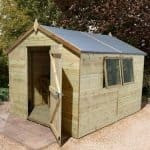 The compact nature and low price of the shed would also make it idea for those on a strict budget or those with limited space in their garden. 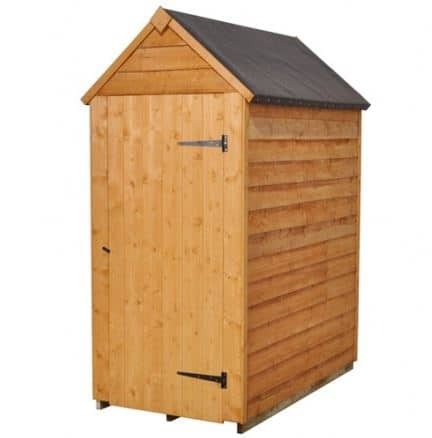 It is a very well designed shed that has a very modern style which we are sure is going to look great in your garden. 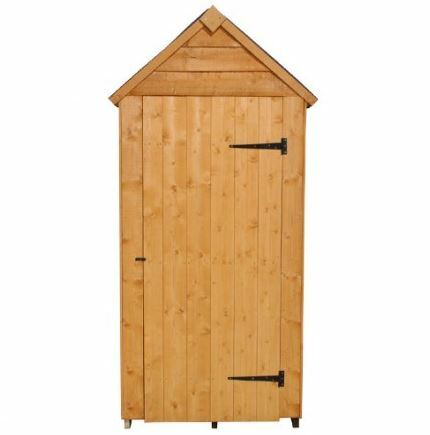 The shed has a wide, single door so getting in those larger more awkward sized items is not going to be hard at all. A lot of time and effort has gone into making sure this is one very high quality shed. The walls are made with this very attractive and robust, 8 mm thick overlap cladding which is going to ensure no rain gets inside. Behind this we have a very impressive framing structure that will keep the shed firm for many years. the floor and the roof are designed to take a lot of weight so the roof is able to handle the heaviest snowfall and the floor your heaviest tools and other items. Buying a first shed can be quite the daunting process, but the Hartwood 3′ x 5′ FSC Starter Overlap Apex Shed is here to make purchasing your first shed an easier experience. This really would be a perfect first time shed and actually it would serve as a fantastic extra storage option for those of you who already have a shed, but just want a little bit extra storage space. 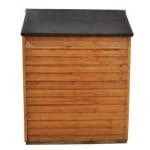 Also those of you on a tighter budget or with a smaller garden would find this shed ideal. Most of the size of this shed is in its depth, where it is a respectable 5 feet 1 inch. The width is a little on the narrow side, but to be fair we expected this and that decent depth does make up for the 3 feet 2 inches of width. The shed is over six feet high so when you are putting the children’s toys away or getting out the mower there is a decent amount of headroom. As this is a rather long shed the apex roof that sits on the top looks very interesting. We are big fans of a long apex roof here and this one while not the longest we have seen does really stand out in a positive way. The roof is not just easy on the eyes either as it is very well made with that lovely sand felt covering some oriented strand boarding which is of a high quality and very strong. The sides and the back of the shed are done with this lovely 8 mm thick overlap cladding. We really like the look of this and are also very happy with its durability so if you do have kids running around the garden then this is able to take a bit of abuse from them. The overlap design will do a fantastic job in standing up against the rain as well so any items you place in here will be well protected from our “awesome” British weather. Even though this is a rather low priced shed, inside it is a very impressive 28 mm x 28 mm frame that makes this one very robust shed. The frame is going to do a great job in making sure this is a shed that has some real staying power so you get any years of use out of it. While the frame is a good thickness it is not overly bulky so you do not have to worry about it eating into your storage space too much. Under your feet and taking the weight of all your belongings is some very strong, oriented strand boarding. This is the same kind of boarding that is used for the roof. This is able to take the weight of a number of heavy items due to the floor joists which are underneath. These floor joists will also keep the shed from sitting directly on the ground which is something that makes this an even more attractive purchase if you are going to be placing this on grass. Treatment will be required shortly after constriction, we always suggest a couple of weeks at the most, even less if you are building this during the winter. Once a year a fresh coating should be applied, you do this and treat the wood with care then rot will never be an issue. 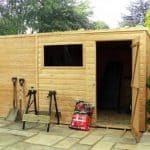 Once you have treated the shed and as long as you take the proper care of it then you will be given a very generous ten year guarantee. 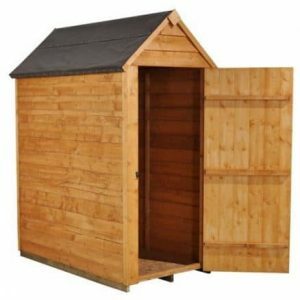 Getting such a lengthy guarantee is just another thing that makes the, Hartwood 3′ x 5′ FSC Starter Overlap Apex Shed great for a first time shed buyer. The door and actually the whole front of this shed has a really interesting look. The door is a single door, but due to the slim design of the shed it actually takes up most of the front of the shed. The door is over 2 feet wide so getting something as large as say a lawn mower in here would not be all that difficult. Two large black hinges are used to not just keep the door in its place, but also give the front a little bit more personality as well. There are no windows on this shed which to be fair is to be expected with the low price. But we do wish there was at least one small window either on the door or one of the sides, we feel that this would have really finished the shed off nicely. There is a turn button on the left side of the door that will keep the door closed, but there is not an actual locking mechanism with this shed. We will not mark it down for this as we have seen many sheds that are as much as 4 times the price of this not have a lock and adding something like a hasp and staple with a padlock is not a hard thing to do at all should you want to give yourself some more security. You do not have any worries about people being able to see any of your belongings as there are no windows on the shed. This means that nothing you own will be on view for any potential thieves or nosey neighbours. 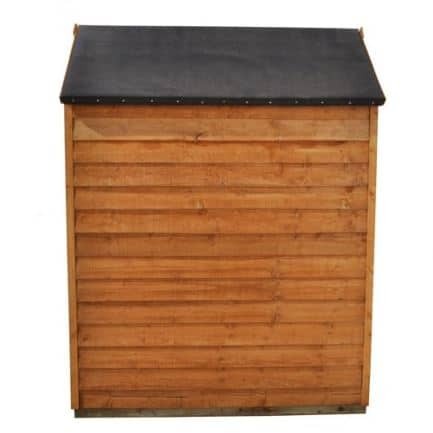 They do offer you the option to change the bottom of the shed as they have a very smart, plastic shed base which can be added for £48.99. If you are not too keen on placing the shed on grass then this would be something to consider. You could also purchase a wood treatment that is coloured so that you can not only treat the wood, but also give it a bit of colour as well. 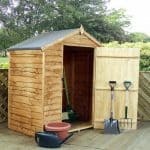 They offer two extras with this shed a that can help you make it more secure. The first one they have for you is a Yale Hasp Steel Black Finish 120 mm & Brass 40 mm Padlock. This will allow you to lock the door and it is very easy to install. Also, at £19.99, we feel it is being sold for a fair price. They have a more advanced security system as well with their Yale Super Durable Deluxe Shed Alarm Security Kit, which is available for £29.99. This not just allows you to lock the shed, but also adds a security alarm. This is one of the more high quality, budget priced sheds that we have seen and in general we are very pleased with how this has turned out. 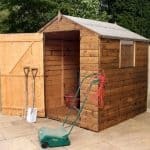 You will have to treat the wood once a year to protect it from rot, but apart from that this is a shed that is going to give you many years of use and ask very little of you in return. 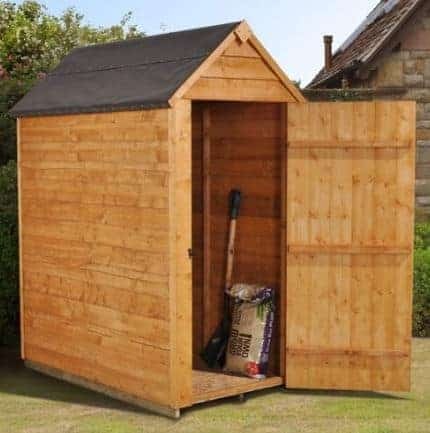 This is a shed that is on the smaller size, but that just means it is perfect for smaller gardens and actually we also feel that with some careful item placement this space could go pretty far. This is a two person job, but not an overly difficult job. If you have a person who is skilled at DIY and also willing to go on a snack run then this should be a rather easy installation and not cause you any major issues. 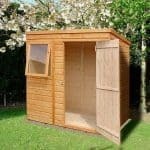 You are getting amazing value for your money with this shed. It is well made and is going to last you for many years. 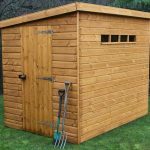 Final Thoughts: The Hartwood 3' x 5' FSC Starter Overlap Apex Shed is a shed which at first glance may seem a little bit on the basic side, but once you take a closer look, you soon realise just what a fantastic shed this really is. It is made so well and not only that, but they have made this be available for such an incredible price and also given it a very attractive look. We really like the overall design of this and feel that it is designed in such a way that it is going to last you many years. 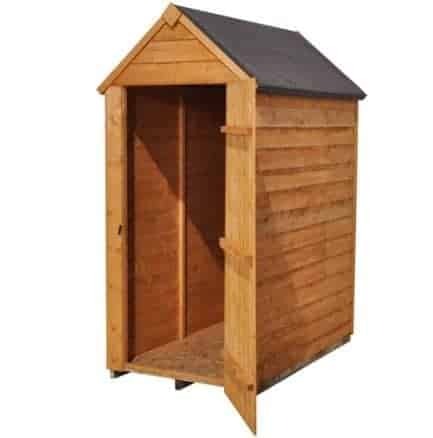 No matter what your situation is or your reasons for needing a compact sized shed are, we have no doubt that this one can meet all of your needs.